I cannot believe I have completely neglected writing my blog. I found out I was pregnant on December 2nd and my focus completely shifted. Being nauseated isn’t really conducive to cooking and writing about foods. Now that I am in my third trimester I am back to cooking and planning menus. Cody and I spent last week in Cabo San Lucas, Mexico and since we have been back I have been craving Mexican food. Who am I kidding, I am always craving Mexican food, Cody says that the baby is going to come out speaking spanish. 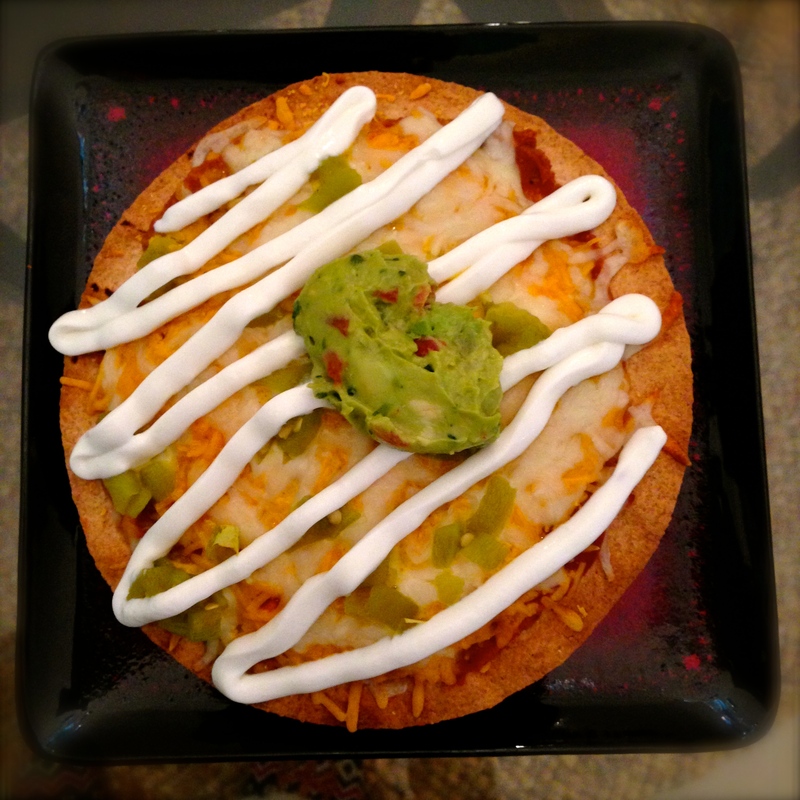 I decided to make Mexican Pizza for dinner last night. This recipe is super easy and doesn’t take long to make. 1 small can of diced green chilies or jalapeños if you like it spicy. Preheat your oven to 400 and arrange the tortillas on a baking sheets. Bake them until they are just getting crispy, flipping them once. If you use whole wheat tortillas they will cook much faster, so keep an eye on them. When the tortillas are finished reduce the oven temp to 350. Once the tortillas are done, spread a layer of beans on 4 of the tortillas, add ground beef on top of the beans and drizzle your taco sauce on top of the meat and sprinkle with cheese. Spread a thin layer of beans on the remaining tortillas and set them, bean side up on top of the other tortillas. Top with a handful of cheese and the green chillies. Bake the pizzas at 350 for 20-25 min, just until the cheese is melted and bubbly. Top with sour cream and guacamole. Enjoy!